Today’s world is hard on backs. At home, at work and at the wheel, more people are spending more time sitting than ever before. . Research has shown that we now spend over 13 hours a day sitting, whether that be by our desk, in our car or on our couches. But seats haven’t kept up with sitting. Poorly designed chairs and seats are everywhere, making good posture difficult if not impossible The problem with sitting for long periods of time is that gravity causes us to naturally begin to slouch in our chair, reversing the curve in the lower back and putting a tremendous strain on the entire spine, resulting in back and neck pain. Adopting a correct sitting posture is the simplest and most long-term solution to eliminate and prevent back and neck pain. The key is to secure your pelvis in the right angle. When your foundation is stable, your entire spine maintains proper alignment. This is where the Bottoms – Up™ posture seat can help. 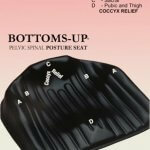 Developed by a top pain management doctor at Cedars Sinai, the Bottoms – Up posture seat forces your pelvis into the most optimal position to support your entire spine from bottom to top. Unlike most posture cushions that simply add an additional support or push you forward, the angles of the Bottoms – Up posture seat cradle & secure your pelvis into an optimal angle, providing an upward lift to the spine with its patented design and construction. 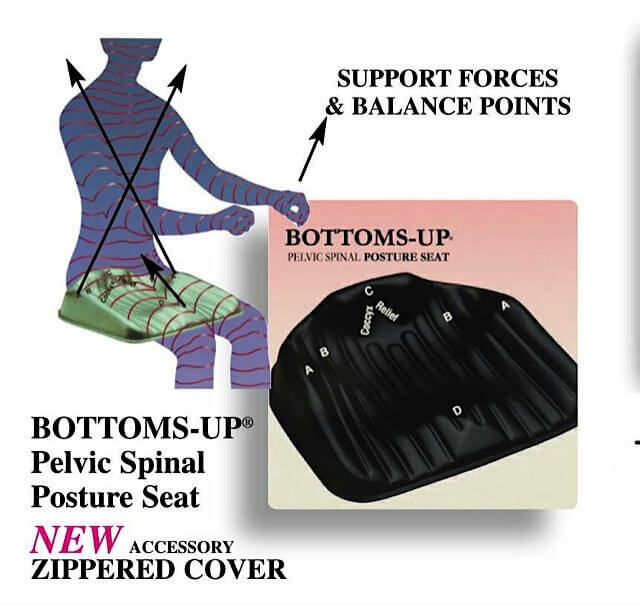 The Bottoms – Up posture seat forces you into the correct sitting posture, teaching you how to maintain the proper sitting positioning. This positioning allows you to avoid pain, maintain more energy over log periods of time and pay more attention to what’s in front of you. Converts any sitting surface into a scientifically contoured seat that encourages anatomically correct sitting posture by providing natural support and a gentle upward lift to the foundation of the spine – the pelvis. Stops you from slouching/ Teaches you how to sit straight. Prevents and relieves back, neck & buttock pain from sitting fatigue. Six pelvic support zones and a coccyx relief zone Balances & supports the front, rear and sides of pelvis while distributing & supporting body weight evenly up the spine. Improves appearance, breathing and energy level since your muscles are not overworked. Highly durable, lightweight with a carry handle. Recommended by top physical therapists for seated postural/ spinal support from head to hips to prevent & manage back & neck pain. Sit on a tape measure with your feet flat around 3 inches apart with knees parallel over your ankles. 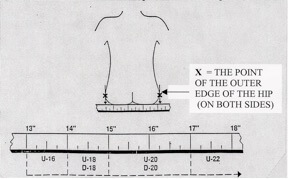 Measure the widest points (X) at the side of each hip as shown. 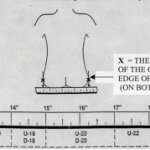 With measurements between sizes, select larger size. If areas’s could have a discriminatory palette’s, mine would register as such. It wasn’t until Vivie Therapy introduced me to the Bottoms-Up Posture Seat that my arse and posture have never quite been the same. I’m naturally sitting straighter, but in addition, I must say my gait has improved and I honestly feel less tired. I use the computer quite a bit at work and often have found myself slumped over the unit. This has not been the case since ordering this comfortable seat. I intend to order one for my car as well in the hopes of possibly improving my alertness while driving. Thanks Vivian for the support – pun intended. I’m a pilates instructor and posture is huge to me but it’s difficult to find the perfect posture while driving all over to see your clients. I have had scoliosis in my lower back since I was a child , sitting in the car or anywhere can hurt sometimes even five minutes in the wrong position . 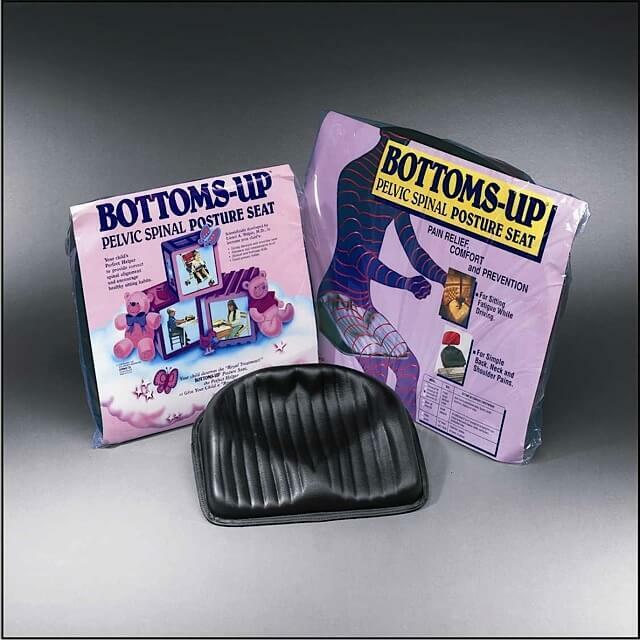 introduced me to the bottoms up posture seat that changed my life .. . I was having horrible hip & knee and leg issues from being in the car long periods of time with no relief .. I have to be honest I was a bit skeptical & it took a few weeks for my body to feel better being in alignment again ..
My back was a bit uncomfortable & just three short weeks later felt much less discomfort in my spine . A few months ago I choose to do an experiment and drive without it once & it was now extremely uncomfortable when I wasn’t keeping perfect posture . I decided to take a long journey across the USA driving with a friend this holiday season & brought my seat along for the ride ( thank goodness ) I cannot believe how much more enjoyable the drive was for me and my friend we both used it while in the driver seat . As I began the flight home I decided to bring my seat with me on the plane . I am a very tall girl and usually cannot get comfortable for even a few minute in a economy seat . However with the posture seat both my five hour flights felt like nothing . I didn’t have a ton of bad leg cramps when I got off the plane .. I honestly don’t think I’ll ever travel without it again . Thank you so much for helping me find relief !! I have had back problems for years. In the 1980’s I was a realtor. I lived in a rural area, I could be in the car most of the day driving many miles to show homes miles apart. 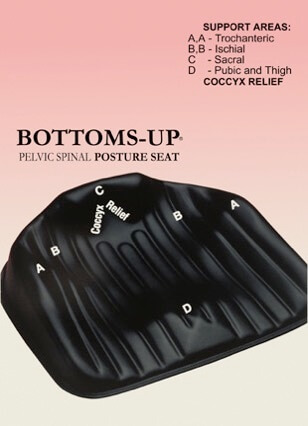 I came across the bottoms up contour seat. Tried it, and have used one since . I could drive miles without back pain! After using mine for many years, it was time to purchase a new one, however I could not find one. Searching the web for something like it, I came across Vivie Therapy! Just received my NEW Bottoms Up seat! HAPPY BACK!!! This seat really works. Try it. You won’t be disappointed . It’s a God sent… I even received it sooner than promised! Thank you Vivian.